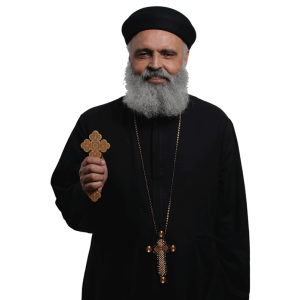 Father Mina Wahba Youssef was born on August 20, 1951 in Meet Ghamr in the Nile Delta. He earned a Bachelor of Arts Degree in Theology in 1975. He served as a consecrated Deacon at Holy Virgin Mary Church in Los Angeles From 1978-1985. On December 22, 1985, His Holiness Pope Shenouda III ordained him a presbyter. He served in Holy Virgin Mary Church in Zeitun, Cairo, Egypt for one year and St. Mark’s in Rochester, New York for eight years prior to serving at St. Demiana Church in San Diego from 1994 till present. He was elevated to the rank of hegumen by His Grace Bishop Serapion on January 21, 2007.